So, I'm kind of obsessed with this sweater I got from Skip N' Whistle. there are cats dressed up as Indians on it. How can you not love it?? Skip N' Whistle is an online retailer based in New Orleans that sells a wide range of clothing and merchandise at great prices. The thing I love most about their shop are the fun designs that are screen printed onto their shirts and sweaters! Seriously they are so unique and awesome--Example A: my Indian Cats Sweater. That sweater is so cute!!! Kinda loving the Tin Man/wizard of Oz shirt! (But your sweater is MY FAVORITE product they have) Seriously HAVE to have it! I'm obsessed with owls! So I love the owl one. The sweater is lovely! I love how you have put the feather in your hair to match. You're looking bloody gorgeous, as always. Blogger crushing over here! I love love the Sugar scull TShirt!! The peace dove and Buddha yoga shirt are cute too. But I wear a lot of black and I love skulls so that's perfect! I like the Crazy Cat Lady tshirt. Thanks! you are gorgeous!! such a natural beauty. Literally too many to choose! I saw your post on Tres Chic fashion today. Great giveaway. I like the sugar skull or cat tshirt! The unicorn... running through space... ;) If I won though I'd let my 3 year old daughter pick the shirt for me though, whichever one she thinks I should have! Love this look! The feather in your hair is gorgeous! Ohhh It's awesome to see another clothing line with cats imprinted! I love this!. It's so me! Haha! http://www.skipnwhistle.com/crazy-cat-lady-yoga-tank-top-8-color-choices/ Thank you for this giveaway! Btw I love your whole look! It's chic and boho! Love the one with the Anchor for the spring and summer time. I'd choose the one that says, "I GIVE HUGS"
I love the Diana Camera t shirt! 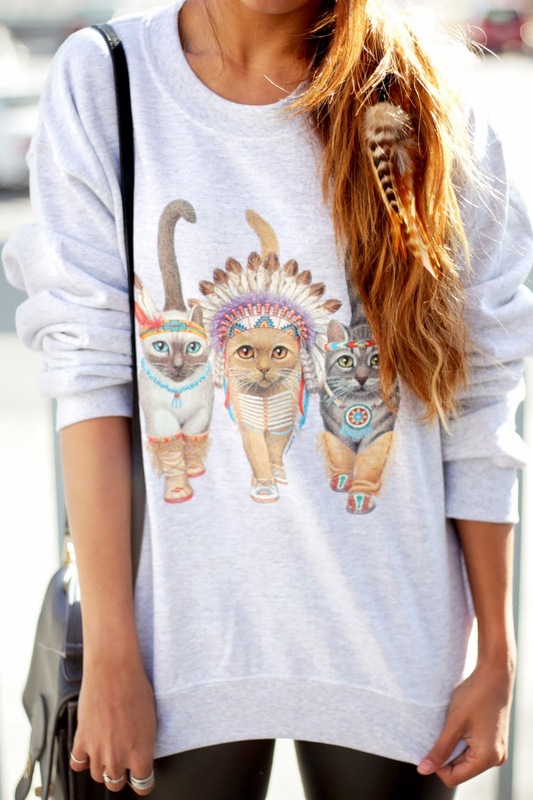 I actually love the western-indian-cats-sweatshirt! I love the dinosaur Christmas sweater shirts. Those are so awesome!! I need a new wardrobe so badly!!! i really like the 'i give hugs' t-rex shirt and the french bull dog with glasses sweater!!! I love the t-shirt that says Read on it, and has an owl. I love the vintage anchor tshirt! Thanks for the giveaway! I love the superhero tee in heather gray! Thanks! I love the lomography t-shirt! Thanks for the giveaway! my favorite shirt cat meow shirt! I like the read owl t-shirt! I NEED that seahorse tshirt. With jeans and a beige sweater - Perfect! I have to have the Buddha Yoga T-Shirt! I like the "I give hugs" tee and 'Unicorns are Lame ". I like the Unicorns are lame one! Love the same sweatshirt you are wearing. Obsessed! my favorite shirt is the anchor one!